It’s almost turkey time! Take a break this Thanksgiving holiday and allow one of the Tampa Bay’s restaurants do the work for you! That means no cooking, no cleaning, no dishes…. Can I get a “Gobble Gobble”? Here is a list of local eateries offering delicious Thanksgiving feasts. Thanksgiving-themed specials including pumpkin soup, turkey confit and bananas Foster station and its regular menu will be served starting at 11 a.m. $34.95 for adults, $14.95 children younger than 11. One of Tampa’s top fine dining establishment will be open and offering their normal menu, with entrees starting at $25; 4 p.m. Reservations recommended. 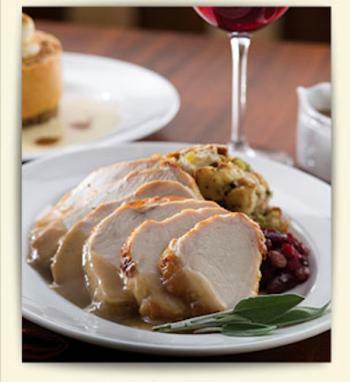 Thanksgiving favorites and their regular menu will be served on Thanksgiving Day starting at Noon. $36 Adults, $15 Kids 2 and under. Reservations are required. Feast on a full Thanksgiving buffet waterfront starting at 11 a.m. $38.00 adults, $10.99 children 12 and younger than 10. Reservations are required. Florida’s oldest restaurant will serve its traditional Spanish menu as well as Thanksgiving dinner with plenty of hot Cuban bread starting at 11 a.m. $21.95 for adults, $5.95 for children 10 and younger. Reservations recommended. Thanksgiving feast with all your favorite Fall favorites including slow-roasted fresh Amish turkey with pan gravy, herb stuffing, Mary&apos;s potatoes and creamy pumpkin cheesecake with fresh whipped cream. $24.99 adults, $9.99 for kids 12 and under. Bring the meal home (serves 8-10) for $199.99. Reservations recommended. Three Thanksgiving specials including roast beef, traditional turkey and ham. This waterfront bar located on Harbour Island will start serving at Noon. $21.95 adults, $10.95 kids under 10. Reservations recommended. Dive into a four-course Thanksgiving meal featuring traditional Italian items starting at 11 a.m. $36.95 for adults, $17.95 for children 5 to 12. Reservations recommended. Thanksgiving buffet with carving station, pasta station, fresh chilled seafood and more starts at 10 a.m. $49 for adults, $18 for children 12 and under. Reservations required. Traditional Thanksgiving dinner with all the trimmings including roasted turkey, herb stuffing, Yukon gold mashed potatoes, butternut squash, French green beans and house-made cranberry relish kicks off at 11:30 a.m. $25.95 for adults. Reservations recommended. A special Fresh Harvest Thanksgiving buffet kicks off at 10:30 a.m. $30 Reservations recommended.